These exotic yarns are custom spun in China for Handknitting.com to our exact specifications into an ultra light and airy 4 ply DK weight, 2 ply Lace weight, 6 ply Worsted, 8 Ply Aran or 12 Ply Chunky weight Yarn.The yardage is wonderful: Sweaters take much less yarn than they would in wool or other common fibers.It comes to us directly from the mill so we can offer you the lowest price on the worlds finest Cashmere Yarns. 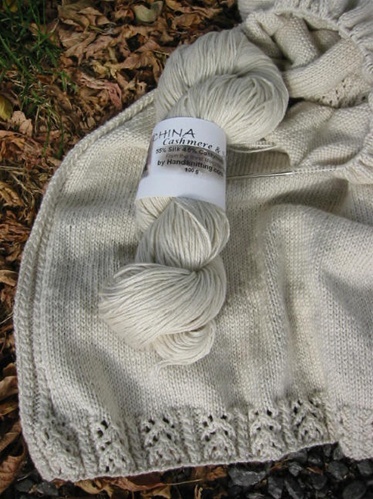 The natural undyed cashmere is a lovely cream color that will compliment any wardrobe. I chose the two-ply natural cashmere for a winter white twin set of cardigan and sleeveless sweater. I only bought one skein so far to try it out. It is a fantastic yarn. It's supersoft and great to knit with (it is hard to stop knitting!). It seems a bit pricey, but it is cashmere and you get very far with just that one skein. In the beginning I considered dyeing the set, but it's gorgeous enough in natural!